Had a great time!! Thank you Swampy and everyone who help made it possible. Also to everyone who looked out for me on Saturday when I had my flat tire. I missed half of Saturday, but thanks to Team Wanker on Sunday I ended up having a great overall ride. Thank you guys! Props to Mrs Swampy, Laurie and Tim (and Aubrie) Knopick, Bill Whalen, Bill Walls, Keith Herve, Rich Bumar, Bert Barnes, Mike Driver, Jack lambert, Tom Rooks, Andy Young, Dave Hall, Steve Vaughn, Becky Stubblefield, and anyone else who chipped in to make the Devil's Creek a success! for the prizes and support provided! What! This thread died a sudden death. Man what a different Devils Creek! Different time of year, sooo dry and dusty, warm and clear skies. Our group ended up with 136 miles Saturday and about 120 Sunday and for the first time in a long time I was hurting on Monday. I thought we were going to complete the event with no problems but Sunday afternoon Rocky had what he said was a series of events. He said his leg got cool and wet followed by his bike stopped running. Seems as how his fuel line ruptured and the KTM refused to go any further without being fed. He had it fixed in a few minutes and we were once again under way. Then my odo suddenly stopped working so Evan took the lead for the rest of the day giving me a chance to dine on some "rich loam". Great job Evan! The weather was just right for "Margarita ville" Saturday night and the food was great as usual. Thanks to all who brought a covered dish, Mrs Swampys breakfast and Miss Linda no one has to be concerned about being hungry at the creek! 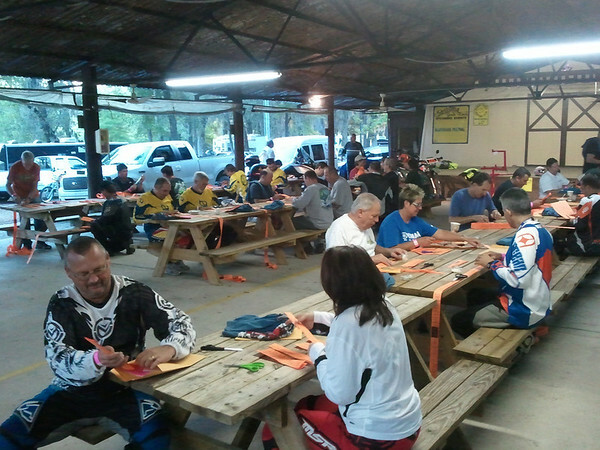 I always have a great time at the Creek and it's the ride I look forward to each year. Thanks Swampy and crew. Just How Old IS Dirt, Exactly? Hey Swampy, I appologize for not making it to Devils Creek this year. I think that would have made 8 years straight. I had a horendous scheule the two weeks before and I could not get myself out of bed that day. Since I didn't make it do i still send in my membership fee? How much is it nowadays?? If it looks deep...it's deeper. 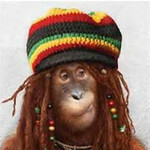 Yep, ask Johnny Africa. The best way out of most situations is more gas. So let's start at tech! 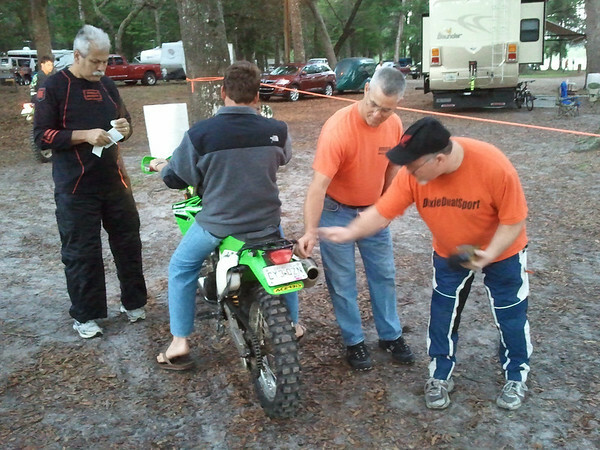 This picture is telling actually as you can see these two guys have Kawasaki KLX250s. 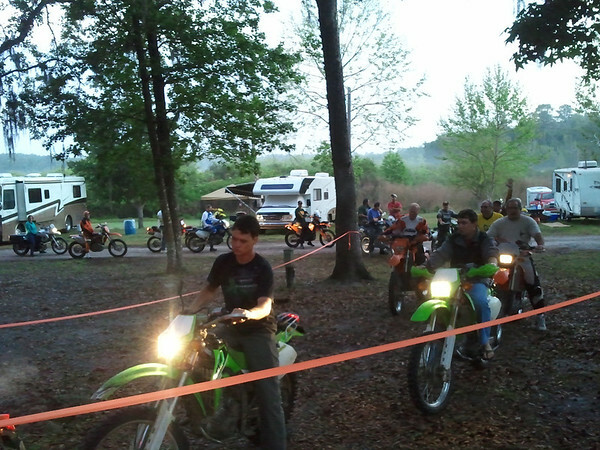 This is the forst year that we had so many KLX's. Usually just Angie's and another stray one, but this year there was a lot of green present! Let the cuttin' and tapin' begin! 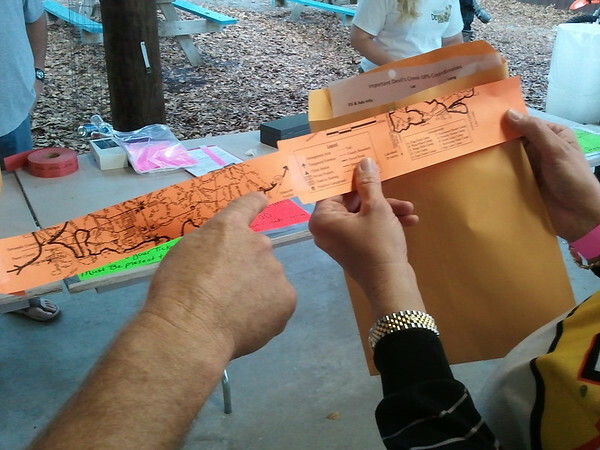 GVetting things right with the route sheet will help you navigate thru the woods! It's important to make sure you get it right and not put the strips together in the wrong order! 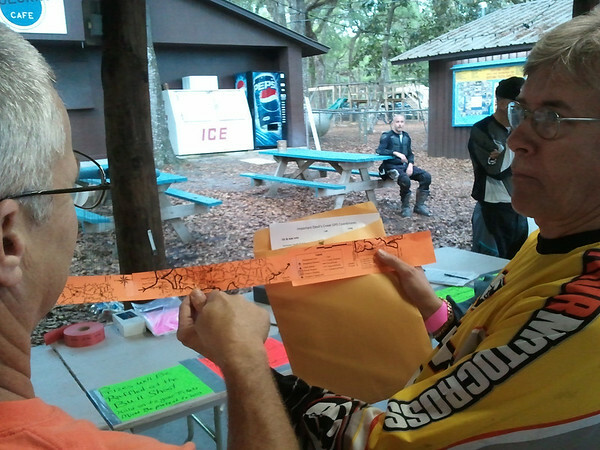 ... uh..... speaking of getting it right here's DKO Dave conferring with Bert on some of the finier details on the route sheet! .... well.... maybe not.... but it does answer a question we all have been asking since the beginning: "How do Dave and Andy get lost all the time?" 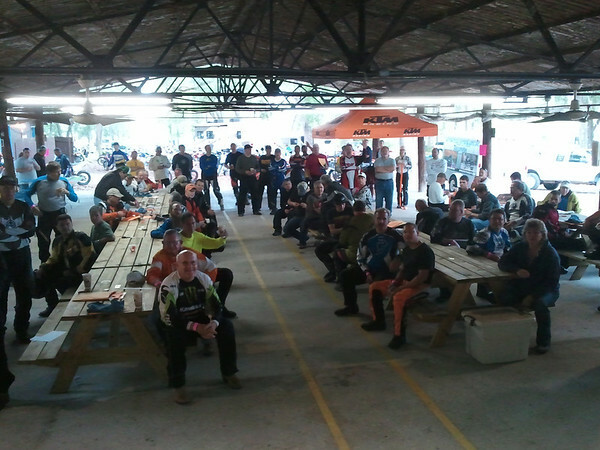 ... and finally the Rider's Meeting! Bee good neighbors, careful stewards of the forest, and have fun! We'll see you at Lunch! 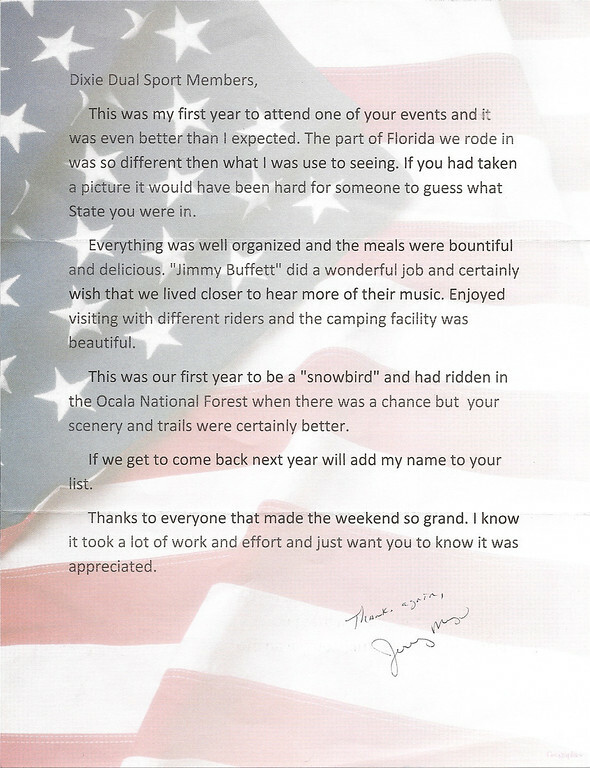 This letter came in from Jerry Myers from Indiana. It's always good to know everyone's hard work is appreciated! I know Swampy's got more pics than just from Sat. morning!